Just like before we will try to cover this in order. You cannot break these services up into different servers now. When you install vCenter Server, you get all these features. You have the ability of an embedded installation, or a distributed vCenter Server System Configuration. With the embedded install, the Platform Services Controller and the vCenter Server are installed on a single machine. A single PSC is suitable for about 8 vCenter machines or services. When you go larger you will need to add additional servers. With a Distributed vCenter Server System Configuration, you will need to first deploy the PSC on a machine and then you can deploy your vCenter Server. Once you select one particular deployment method, it can’t be undone. The first thing you will need to do when configuring a fresh install (and you have chosen just the Platform Services Controller option) is choose and create a SSO domain. 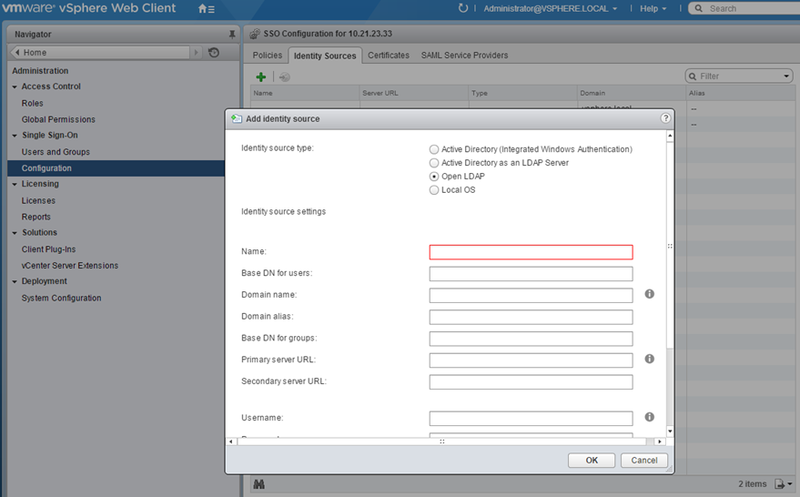 If this is an additional PSC, then you would join a vCenter Single Sign-On domain. Then enter a password for the administrator, and a Site Name. The next screen will be to accept the default ports or chose new ones. Then go through the next screens of Destination Paths and then confirmation screen. The screens will be roughly the same for the appliance with a few added ones, such as choosing your datastore and network settings. As far as managing the PSC, most has to do with your setup, and making sure that you setup the proper deployment method to begin with. After that, you can do things such as load balance and make your PSCs Highly available. The way you do this will depend a lot what kind of servers you deployed. Was it the appliance or the Windows machine. There are many different methods to do this, and you can even mix and match depending on customer requirements, especially since the new appliance is capable of Linked Mode in vSphere 6. Then of course you can configure the individual services making up the PSC. Generally you won’t need to do any sort of certificate management in vSphere 6. The reasoning behind this is that the certificates that the VMCA issues are valid for 10 yrs. However, occasionally you might run into a situation where the user needs to either comply with some sort of HIPAA compliance or a user that got over zealous. So we know that previous versions of VMware used self-signed certificates -this new version of vSphere now has a full on Certificate Authority. What does this mean? This means that we can now generate our own certificates or we can configure this as a subordinate certificate authority to use a third-party certificate such as GoDaddy or some other recognizable authority. When you do need to change certificates for some reason, you can do so using the certificate manager utility. On the Windows machine you just pull up an Admin CMD Prompt and type in certificate-manager. In order to make the VMCA a subordinate CA you will need to do the following steps. Log into the PSC and using openssl, generate a certificate request. Can I disable SSO 5.5 in vCenter Server? 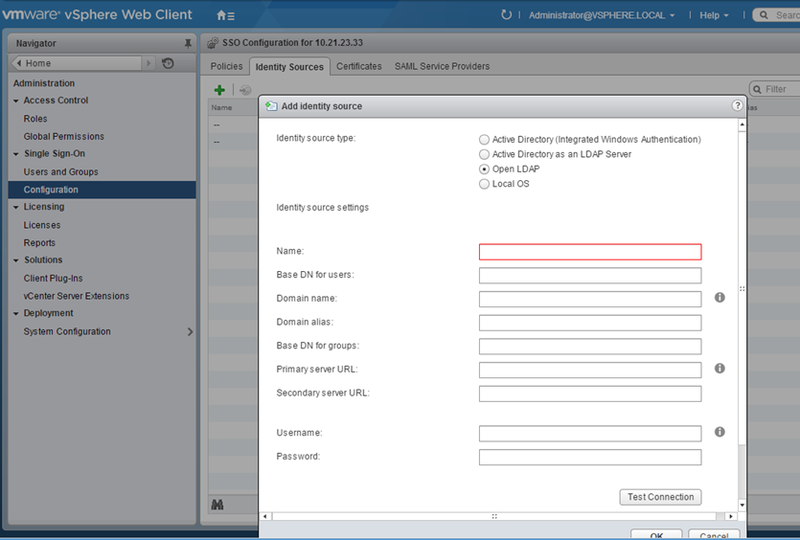 No, you cannot disable SSO 5.5 in vCenter Server 5.5. This is similar to vSphere 5.1. At any time only one default domain exists. If you do no belong to that one, you will need to add your domain to the username for it to work. And finally to add or configure identity sources you will need to be a SSO administrator. Here is a screenshot of where to find the identity sources for a refresher. And stay tuned for the next new set of objectives.